The Palm Springs Aerial Tramway is a breath-taking attraction, not to be missed. Climbing up the sheer cliffs of Chino Canyon, the ride begins in the northern section of Palm Springs, and lifts passengers up to the summit in the St. Jacinto Mountains, elevation 8,516 feet. The Tramway was envisioned in 1935 by electrical engineer Francis Crocker as a way to escape the heat of the valley, and it still serves that purpose today, offering visitors to the desert area a chance to, as Crocker used to say, “go up there where it’s nice and cool.” The steep canyon posed construction and access challenges that were met by an innovative use of helicopters, which were used to haul the men and the materials needed to construct the Tramway’s towers and summit station. The Tramway opened to great success in 1963. The Tramway has since been modernized – passengers today ride on the world’s largest rotating tram cars. More than 12 million people have taken the ride up to the Mountain Station, which features two restaurants and a bar, the popular Lookout Lounge. All provide sweeping views of the Coachella valley below. 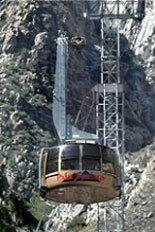 Passengers can travel from the floor of the Coachella Valley to a point near the peak in about 12 minutes. The trek up the mountain encompasses five ecological zones, including the Sonoran Desert where the journey begins and the summit, an alpine woodland environment. The elevation is approximately 6,000 feet higher than the starting point, and the ambient temperatures can be as much as 40° Fahrenheit colder. Once at the top, guests can take guided nature walks, dine in the mountaintop eateries, camp and snowshoe or cross-country ski. On a clear day, the view can extend as far as 200 miles to the north and 75 miles to the east and west. An authentic tramcar displayed near the entrance was featured in scenes of a 1967 episode of Mannix and a 1971 installment of Mission Impossible. The aerial lift is equipped with the largest rotating tramcars in the world, which have floors that perform two complete revolutions during the breathtaking journey. This modern innovation enables passengers to enjoy majestic views without walking around inside the tramcar. To beat the crowds, consider a week day trip up the mountains. Monday through Friday, the Tramways cars depart from the Valley Station every half hour, with the first car leaving at 10:00 am. Saturday, Sunday and holidays, the tram departs at 8:00 am, with the last tram leaving the mountain at 9:45 pm.